Personally Fit, Inc. is a 10,000 square foot fitness facility, with advanced exercise equipment to meet all of your fitness needs, unique fitness classes for all ages and abilities, and an experienced personal training staff. Our friendly, non-intimidating atmosphere is ideal for individuals interested in beginning or continuing a fitness plan with or without medical and/or specialized supervision. Our advanced personal training and rehabilitation staff can also develop programming for the individual with a more extensive fitness background, interested in a more rigorous, but safe and effective workout. Whether your needs involve rehabilitation, general fitness, or advanced exercise instruction, Personally Fit, Inc. has the personnel, facility and comfortable environment, just for you! Click here for membership information. We offer physical therapy and rehabilitation as well as fitness services, all in the same environment, which contributes to a healthier, safer, exercise program for you! Our personal training staff have college degrees in exercise science/kinesiology, with specialized certifications in a variety of areas including Pilates, Yoga, Fall Risk Reduction, Osteoporosis Prevention, Breast Cancer Rehabilitation, Golf Fitness, Back Rehabilitation, and much more! Our physical therapy staff is involved in the development and supervision of our programming, which provides for unique, rehabilitation-oriented equipment and class programming! Our facility maintains a lower density of members than the traditional fitness center, which means no waiting in line for equipment, and more efficient exercise for you! Our service is PERSONAL and we want you to be PERSONALLY FIT! Here at Personally Fit, our certified personal trainers will help you achieve results faster. We know that everybody is unique and therefore needs a customized exercise program. Many of our fitness members and Physical Therapy clients choose personal training as a continuum of achieving their personal fitness goals. Whether you are recovering from an injury, wanting to update a workout, challenge yourself or begin a fitness program, personal training is a safe and effective means to do so. Each of our trainers is specialized in their own unique way to fit your individual needs. Each provides their own rates that are customized to fit your needs. If you are interested in Personal training, please visit our Personal Training page for more information. Flexibility: Our personal training staff will design and complete a hands on flexibility program designed to improve your trunk flexibility for the improved torso turn necessary to maintain and improve driving distance. 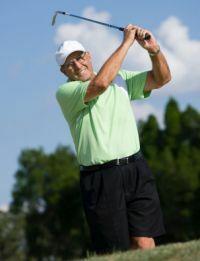 Strength: Utilizing an efficient trunk and upper extremity strength program, our personal training staff will improve your core strength and posture, thus contributing to improved power with your swing in addition to spinal and shoulder joint protection in an effort to reduce the risk of injury. MEDX: These sophisticated pieces of equipment are critical to the success of our program. The MEDX Spinal Extension Machine is the only equipment that isolates to your back extensor muscles, and insures that weakness in your back is not an issue with your golf game or with back pain. The MEDX Rotary Torso Machine is the best equipment available to insure strength through the full torso turn with your golf swing. 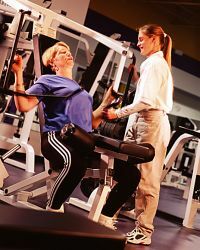 Our personal training staff offers a package of ten 30 minute personal training sessions for $350. Current personal trainers involved in this program include Megan Moynihan and Mickey Burke. If you have any questions about this program, feel free to reach out to Megan or Mickey by email or phone. The MEDX Lumbar Machine was developed, proven and perfected by independent study at the University of Florida. Personally Fit promotes the use of MEDX as an integral part of our spinal rehabilitation programs. The key benefit of MEDX is strengthening of the trunk extensors or back muscles. Many people experience back pain with weak back muscles as a contributing factor to frequent strain. Through our six week training program on MEDX, participants can objectively strengthen their back muscles often reducing or eliminating back pain. The MEDX requires one on one attention by a staff member in order to complete an exercise session. It is highly sophisticated and can not be utilized without assistance. Exercise may be the last thing you feel like doing after breast cancer surgery. However, recent studies indicate a link between moderated physical exercise and improved quality of life for breast cancer survivors. The Pink Ribbon Program is dedicated to promoting a healthy lifestyle and positive body image to all breast cancer survivors. The program will help stretch and strengthen the shoulder, chest, back and abdominal muscles, allowing women to regain full range of motion to those areas affected by breast cancer surgery. The Pink Ribbon Program is suitable whether your surgery was recent or several years ago and accommodates all fitness levels. For more information please visit www.pinkribbonprogram.com. Enhances physical and mental well–being. At Personally Fit we offer the Pink Ribbon Program via our certified Breast Cancer Exercise Specialist, Carrie Maruna, PTA. She implements an 8 week post-operative workout enhancing recovery for breast cancer survivors to help regain range of motion, strength and improve quality of life. This program is 30 minutes session two times a week. Parkinson’s disease can manifest itself differently in each individual. Here at Personally Fit we often treat individuals’ at all different stages of the disease within our physical therapy services. We strive to assist in mobility, range of motion, balance and function of daily activities. Although our therapy services are beneficial, it has been found that group classes can add to the ongoing needs of those with Parkinson's. Under the instruction of Doris Flood, owner and physical therapist, this class is to provide a small group format with individual attention and compassion being our foremost goal. This class can provide opportunities to socialize and meet friends with similar challenges. This specialized class is designed to increase functional strength and power as well as improve posture, stability, balance, coordination, and speed of movement. Class meets Tuesday and Thursday from 2:00 – 3:00 pm. Parkinson’s Class $ 10.00 per class. You need not be a member or patient to attend. Dan Westfall is an independent contractor at Personally Fit working closely with the Physical Therapists and trainers. He gained his certification in Massage Therapy at Mueller College of Holistic Studies in San Diego in 1985. In 1989 Dan received his Holistic Health Practitioners certification and in 1994 was among the first to be Nationally Certified in Massage Therapy. Dan helped in opening the spa at the Rancho Bernardo Inn in 1989 and remained their senior therapist for 18 years. His work is geared towards assisting therapy and fitness efforts by helping speed the recovery process from exercise by reducing excessive muscle tension and pain, increasing blood circulation and the removal of wastes. His massage style is a combination of Swedish, Sports, Deep Tissue and Acupressure. Each massage is tailored to the individual's needs, abilities, likes and dislikes. While therapeutic massage can sometimes involve discomfort, Dan prefers to coax a muscle to relax rather than beat it into submission.